And if ever there was a fan base that utterly adores the object of their affection, it's Daniel O'Donnell fans. When you bring the two together magic happens. It's why Daniel & Majella's B&B Road Trip is such a hit - that heady mix of country star and fervent fan within the fan's own home is TV gold. This week Daniel took the time on board an Aer Lingus flight to make the day, perhaps even the year, of fan Annie, who was jetting off for a "milestone" birthday. 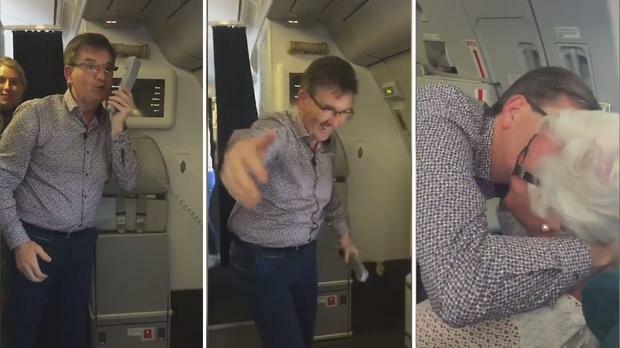 The Donegal singer was introduced by one of the flight staff and he took to the intercom to sing Happy Birthday to Annie, who was seated directly in front of him. He then gave a delighted Annie a hug and wished her many more happy birthdays.